specify a node by its individual address, by some common group ID, by class of service it can provide, and (by default) as a member of the global network for true broadcast capability. "you must check into an NCS to connect ... 11 - Connecting any stations together requires some form of handshaking. This protocol, for the overhead of control packets at sign-on, will prevent much traffic that would go to stations which will not happen to be on-the-air at the time of connection attempt. Remember, there is no "Network Controller", just a friendly station who wants to help new stations determine who's on channel. 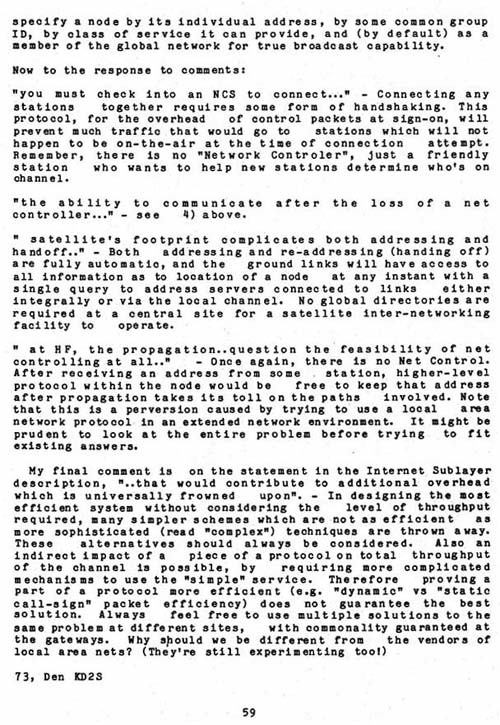 "the ability to	communicate	after the	loss	of a net controller..." - see 4) above. "satellite's footprint complicates both addressing and handoff.." - Both addressing and re-addressing (handing off) are fully automatic, and the ground links will have access to all information as to location of a node at any instant with a single query to address servers connected to links either integrally or via the local channel. No global directories are required at a central site for a satellite inter-networking facility to operate.
" at HF, the propagation.. question the feasibility of net controlling at all.." - Once again, there is no Net Control. After receiving an address from some station, higher-level protocol within the node would be free to keep that address after propagation takes its toll on the paths involved. Note that this is a perversion caused by trying to use a local area network protocol in an extended network environment. It might be prudent to look at the entire problem before trying to fit existing answers.